The slit-lamp is a low-power microscope combined with a high-intensity light source that can be focused as a thin beam. 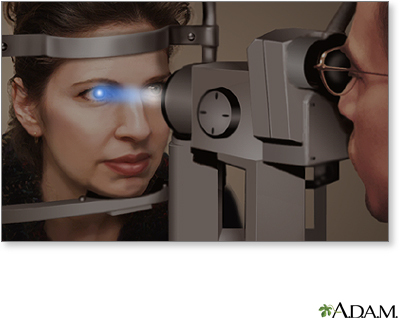 The health care provider will examine your eyes, especially the eyelids, cornea, conjunctiva, sclera, and iris. Often a yellow dye (fluorescein) is used to help examine the cornea and tear layer. The dye is either added as an eyedrop. Or the provider may touch a fine strip of paper stained with the dye to the white of your eye. The dye rinses out of the eye with tears as you blink. Next, drops may be placed in your eyes to widen (dilate) your pupils. The drops take about 15 to 20 minutes to work. 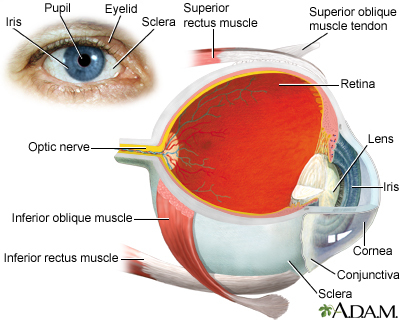 The slit-lamp examination is then repeated using another small lens held close to the eye, so the back of the eye can be examined. Your eyes will be sensitive to light for a few hours after the exam if dilating drops are used. This list does not include all possible diseases of the eye. Miller D, Thall EH, Atebara NH. Ophthalmic instrumentation. In: Yanoff M, Duker JS, eds. Ophthalmology. 4th ed. Philadelphia, PA: Elsevier Saunders; 2014:chap 2.8. The lens of the eye is normally clear. 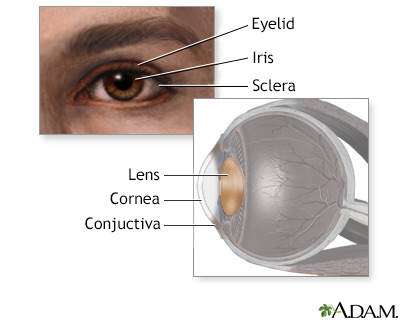 If the lens becomes cloudy or is opacified it is called a cataract.